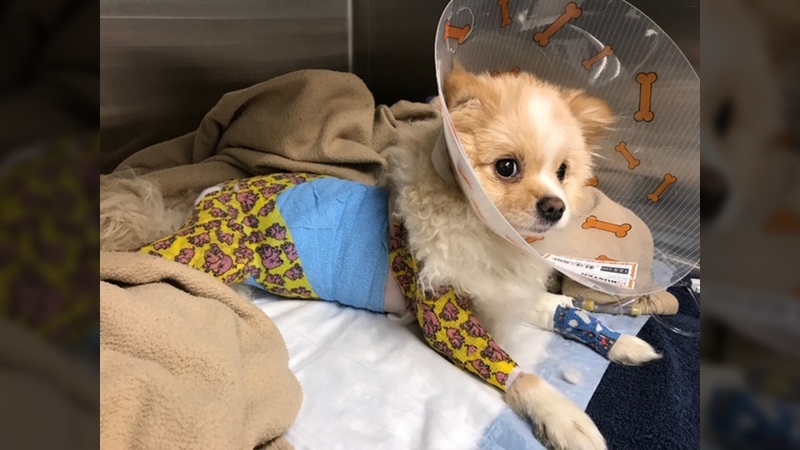 The BC SPCA is seeking donations to help cover the medical costs for a Pomeranian puppy that has suffered what the organization described as "horrific abuse." Animal protection officers were called in after the shelter's Vancouver branch received a report alleging the eight-month-old puppy named Kiki had been abused and was taken to a local vet. “Upon examination, it was discovered that this dog had a severe skin infection that covered the majority of its body and legs,” said Senior Animal Protection Officer Eileen Drever. Kiki also had signs of earlier fractured ribs and was terrified. “This dog has been abused,” Drever said. Photographs of Kiki taken at the time showed severe red skin patches that were sloughing away. Someone had tied a bandage tightly around one of her back legs which may have contributed to the massive infection. Drever says the animal was in terrible pain. “Just to touch the dog would have caused excruciating pain," she said. 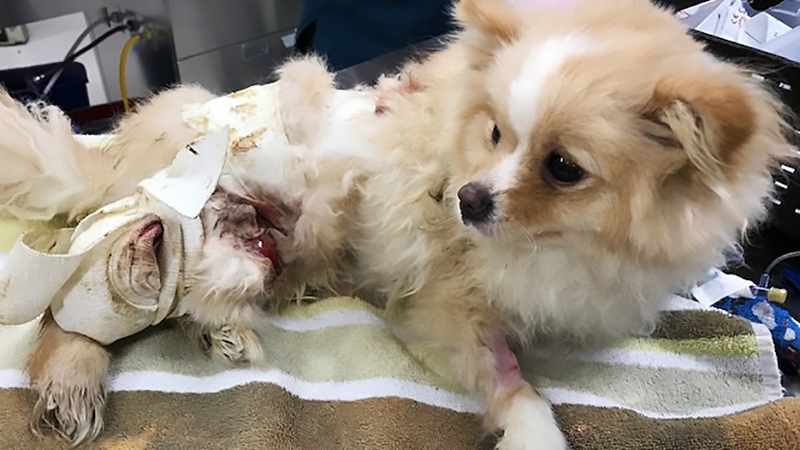 Kiki's co-owner surrendered her to the animal protection officers at the veterinary clinic, and the tiny, fluffy dog — now mostly shaved to treat her skin — is in 24-hour care with a veterinary technician, and requires bandage changes every three days. While her physical wounds are getting better, her caregivers are also working to regain Kiki's trust. “Because psychologically, this dog has suffered tremendously,” Drever said. Kiki will be in foster care for at least two months, possibly longer, then the SPCA will determine what is best for Kiki's future. The cost for Kiki's care will be about $6,000. A fundraiser has been established by the BC SPCA for the public to donate directly to help Kiki. And while the pain and suffering Kiki lived through in her eight short months is horrific, Drever does see a bright spot for the little dog. “I’m happy to say that she is starting to trust again," she said. 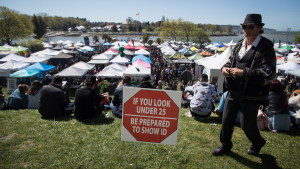 The BC SPCA will be recommending cruelty charges under the Provincial Cruelty to Animals Act. It will then be up to Crown whether it will pursue them. Donations can be made on the SPCA website, in person at 1205 East 7th Avenue in Vancouver or by calling 604-879-7721. Pomeranian puppy, Kiki, is seen in this photo from the BC SPCA. Pomeranian puppy Kiki is seen in this image provided by the BC SPCA.